Enthusiasts searching for the very best in cutting-edge, performance TVs give the Sony Bravia XBR-46HX929 a serious look. Built-in Wi-Fi, plenty of Internet apps. Sony XBR-HX929 series information: This review is based on our hands-on experience with the 46-inch XBR-46HX929 TV. However, our observations also apply to the two other sizes in Sony’s XBR-HX929 series of LED TVs, including the 55-inch XBR-55HX929and 65-inch XBR-65HX929. According to Sony, the three sets have identical specifications (save dimensions and weight) and should offer similar performance. The Bravia XBR-HX929 LED-backlit 3D LCD TV series recently introduced by Sony features “local dimming,” a technology that facilitates excellent contrast and black levels that can match or rival that of plasma TVs. Though local dimming was introduced a few years ago, manufacturers seem to have favored less expensive LED backlighting options in order to drive prices down and attract consumers. It would seem that trend continues, since Sony has reserved local dimming for its three top-of-the-line models this year. Of course, premium tech usually demands a premium asking price, and that is certainly the case here. Still, while Sony’s XBR-HX929 line certainly isn’t bargain priced, its feature set and performance potential make them a pretty attractive option for those looking to get all the cinematic performance of a plasma in an efficient and super-slim LCD sized package. In this review, we take a look at the 46-inch model in Sony’s new line and find out if it delivers the goods for its relatively hefty price tag. The Sony Bravia XBR-46HX929 comes in a considerably smaller package and is just a bit lighter than the 46-inch Toshiba we recently reviewed – 42.8 pounds. Inside the box, we found the display, its table-top stand, a component video/AV dongle, power cord and user manual. Attaching the panel to the stand was a simple and quick process, though we felt ourselves worrying about stability as we tightened the last of the necessary screws. The displays in this series are stunningly attractive. The super-thin bezel on our 46-inch review sample may be a tad thicker than some of the “nearly edgeless” models from Sony’s competitors, but there’s something especially classy about the way this TV’s Gorilla Glass meets flush with the edging in one seamless piece, keeping the surface totally flat and “seemingly edgeless.” Aside from some barely noticeable status LEDs, only Sony’s moniker breaks up an otherwise squeaky-clean front surface. The rear of the display is almost as flat as the front, save an oddly placed RS-232 “box” that single-handedly manages to add an unnecessary ¾” to the TV’s depth. It’s a cheap-feeling, out-of-place addition that looks like it was slipped in at the last second. As for connectivity, Sony hit all the right points. We found two USB ports, four HDMI inputs (one with audio return channel, or ARC), PC video and audio inputs, coaxial cable input, Ethernet jack, optical digital audio output, headphone output and a space to connect the provided dongle for old-school component video and composite jacks, should those connections be desired. Ah, and the RS-232 jack, of course. 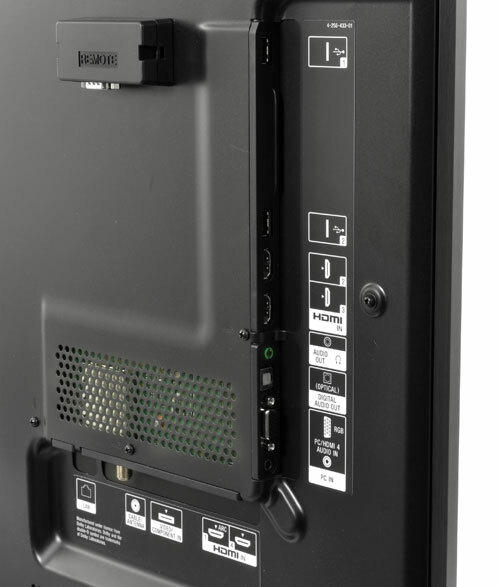 The inputs are split up between the lower back portion of the back panel and the upper left side for discreet cable connections or easy access, respectively. Jammed under the hood is a ton of processing and proprietary Sony extras as well as a suite of Internet content apps. We like Sony’s presence sensor, which uses a built-in “camera” to monitor the room and shut of the display if it is abandoned for a specified duration. It will also display a big warning sign should children (or adults, really) get too close for safe viewing. That same sensor allows the TV’s optional “Ambience Sensor” to adjust the display’s brightness according to lighting conditions and can adjust picture based on viewers’ positions in the room, too. What the camera won’t do, however, is work with the TV’s built-in Skype capability. To use Skype, you’ll need to pick up the CMU-BR100, which currently goes for about $100. As for Internet content, the Sony offers most of the usual suspects and built-in Wi-Fi to get at them if an Ethernet cable isn’t available. Netflix, Amazon VOD, YouTube, Hulu Plus, Pandora and plenty others are present but, unlike Sony’s Blu-Ray players this year, this TV doesn’t offer Vudu, thus missing out on much of the service’s excellent HD content. We like the remote control Sony offers with this series of televisions. A power button located a third of the way up on the back of the remote ended up being a nice convenience, as did the large navigation wheel on the front. Most of the critical buttons are illuminated by the remote’s blue back-light, but the button that engages the backlight isn’t all that well placed. Though this set is capable of delivering 3D images at 1080p resolution, the active-shutter glasses needed to enjoy it are not included. At this price, we’d expect to see a couple tossed in — and perhaps that’s just a promotion away — but for now, expect to shell out about $70 per pair. On the plus side, the glasses are USB rechargeable.